In this post I am going to show you the new projects list. SharePoint sites are ideal for managing a project. There have been books written about this subject so if you need to do this there is plenty of material available. SharePoint 2010 provides a list known as project tasks. As for any list you can use Site Action | More options to see the types available for creation. Once you have added a project Tasks list you can add Tasks or Summary Tasks from the ‘New’ button in the ribbon. The summary task is like a folder for related sub tasks. I have added a ‘kick off meeting’ task as a pre requisite for the new group of tasks required to plan the ‘Review Material’ group of sub tasks. In the main view I now see ‘Review Material’ as a hyperlink. 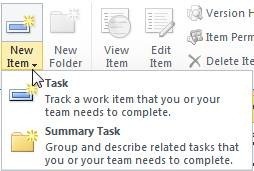 If I click on this I see a view of the tasks for this group of summary tasks. Using other buttons on the ribbon I can compress/ expand the date range shown and scroll down to tasks. In order to keep the displays in this post simple I have omitted assigning the tasks to users and omitted setting dates and other pieces of information. Keep in mind however that the project task is a SharePoint list which means you can customise it, set alerts, use RSS feeds, Create new views etc etc. In short it builds on the underlying list technology which already gives huge number of features available for use in building solutions. So does this replace tools like Microsoft Project and Project Server? Not really the tools in SharePoint are there as a starting point for the simpler type projects. Adding Project Server takes it to a new level. This emphasises how SharePoint 2010 is an extensible platform that you can use in many ways. And finally here is my suggestion for making SharePoint a success for you and your organisation. Start using it! I know this probably sounds a little too obvious but reading posts and articles is not enough. So here is the real suggestion, set up a study site for SharePoint 2010 and encourage all of the people who are investigating it to share notes and experiences and links to useful resources. Of course you can take this a step further and put together training plans using the project task list! And of course schedule and take our SharePoint 2010 course, the development of which is progressing nicely. Soon we will carry out the Alpha test. This is where Dux presents the course internally to myself, Karen and possibly other Learning tree people. Karen and I will be making Dux justify the content in every page and we will test each exercise. We also have to make sure it all flows along nicely and make sure it serves its purpose. Following this the next step is the Live Pilot in Washington April 13-16 !